The DNA testing company 23andMe has been in a state of flux for a very long time, leaving genetic genealogists wondering if there really was any reason to test with 23andMe. First, 23andMe has always been focused on health results more than on genealogy results, so the utility of the testing there for genealogy has always been somewhat iffy. People who test for health issues don’t tend to be interested in genealogy and so are largely unresponsive to requests to share information. But the resolution of the tiff left genealogists in even more of a “why should I test with these guys” quandary, since the price of the test more than doubled — to $199 — and the health information being provided… well… let’s just say that not everyone was convinced it was worth the extra money. We’ll talk about that in a minute. So… what happened was predictable. Although there are some new features that are good for genealogists, the number of new people testing at a price point much higher than competitors was — shall we say — disappointing. And 23andMe finally came around. There is now an ancestry-only option at 23andMe, and the price point is back to where it should be to be competitive. You can test for ancestry only at 23andMe for $99. So… if you’re thinking about testing with 23andMe, which way should you go? What’s the deal with health + ancestry versus ancestry only? Is the health testing worth it? You have to make that decision yourself. I can only tell you that the health reports for test-takers in the United States, after the FDA kerfuffle, are far less comprehensive than they used to be, or than they are outside of the U.S. Right now, those who are newly-tested and get the health reports get seven wellness reports (lactose intolerance, saturated fat & weight, alcohol flush reaction, caffeine consumption, deep sleep, muscle composition and sleep movement), 22 traits reports ranging from taste and smell to facial features to hair to physical responses, and 41 carrier status reports for conditions ranging from cystic fibrosis to Zellweger Syndrome Spectrum (PEX1-Related). So… your choice on the health + ancestry option, but at least the ancestry only option is back to being reasonably priced. Whether testing with 23andMe at all is worth it, remember one thing: this kind of research is fishing for cousins using your DNA as bait. So the right company for you to test with is the company where your critical match has tested. Which company is that? You’ll never know until you test — and encounter that critical match. That cousin with the family Bible or the family photographs you’ve never seen. The option of choosing between an ancestry-only test is only available in the US. In other countries the 23andMe test has always been very expensive compared to FTDNA’s Family Finder test making it impractical to use it for genetic genealogy purposes. However, the health reports in the UK at least do represent good value for money. In the UK the 23andMe test went up from £149 to £169 (currently around $205) at the end of September. The price in Ireland and Europe also went up from €149 to €169. Thanks for that additional insight, Debbie! I believe I saw an ad for Target selling test kits for 23and me with the two options. This must be only in Canada. I thought Target stores were closing in Canada. When I first tested with 23andMe in early 2010, they offered three versions of the test: $499 for the Complete Version, $429 for the health only version, and $399 for the Ancestry Only version. Upgrading from the Ancestry Only version to the Complete Version was $150. For a variety of reasons, it is no longer my autosomal testing company of choice – that would be FTDNA. 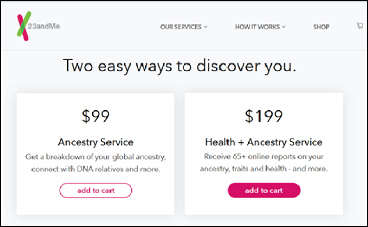 If you pay only for the ancestry results, does 23andMe still incorporate your DNA results into their behind-the-scenes data pool to feed into their ongoing health research and studies? One of the things that struck me when my wife and I tested at 23andMe after already having tested at Ancestry and Family Tree DNA was how few viable matches we got. I had thought, with a database of over 1,000,000 customers (at that time about comparable to Ancestry’s) we would have about as many matches as we had at Ancestry, and certainly far more than at Family Tree DNA. Not so. My wife’s kit currently has 17,000 matches at Ancestry, about 1,700 at Family Tree DNA, and about 1,500 at 23andMe. Of those 1,500 only a subset are non-anonymous and willing to share. Someone pointed out that not everyone participates in DNA Relatives (where your DNA is matched with other people’s DNA). Based on the number of matches in my wife’s case, I’m guessing that the opt-in rate for DNA Relatives must be only about 20% and the effective database of people you can be compared to is about the size of FTDNA’s – about 250,000 maybe. With all the other drawbacks, that makes 23andMe a pretty poor return on investment compared to its competitors – at least for genealogists. Don, it really depends on where your ancestors are from. Since I only have one grandparent born in this country, for me the best company is the one with the largest foreign database. That is clearly 23andme, next ftDNA. I have connected with more than 30 Norwegian cousins via 23andme. Direct to consumer DNA testing for any purpose is still a relatively new field. I am glad when anyone tests for any reason. Yes, a bunch of folks test for reasons other than genealogy and many of them do not answer emails, but some of them do. I celebrate the ones who do answer – if they had not been interested in their ancestry admixture or learning about health results, they never would have tested at all and I never would have found them. On our (SNPedia’s) Testing page, http://www.snpedia.com/index.php/Testing, we summarize how many of the variants known to SNPedia are tested and therefore included in the average 23andMe $99/$199 datasets (as well as for products from other companies), to give people interested in health reports a sense of overall genome coverage.